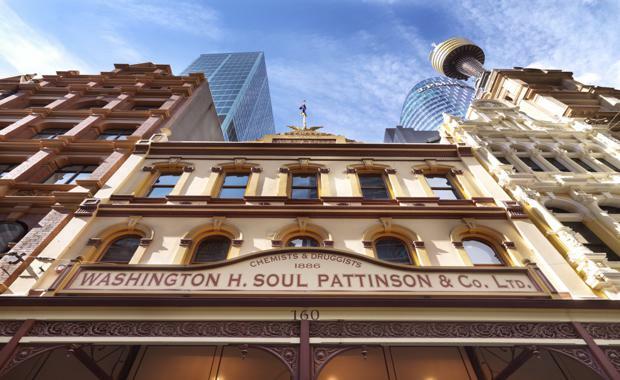 An historic Pitt Street Mall building that has been home to the Soul Pattinson pharmacy for almost 150 years is now on the market for the first time. 160 Pitt Street, the location of Soul Pattinson pharmacy for close to 150 years, comes to the market for the first time, offering significant value enhancement opportunitiesJLL’s Simon Rooney and Rob Sewell have been appointed to sell the Sydney retailing icon, 160 Pitt Street alongside financial adviser Pitt Street Real Estate Partners, on behalf of Washington H. Soul Pattinson & Company Limited. The property has been occupied by Soul Pattinson Chemist and Group Head Office since 1873, ideally positioned for immediate income reversion and significant value enhancement. Mr Rooney said, “160 Pitt Street is one of just 10 properties with Pitt Street Mall frontage, highlighting the scarcity of super-prime investment opportunities and the highly consolidated nature of the mall, being just two-thirds the length of Melbourne’s Bourke Street Mall and half the length of Brisbane’s Queen Street Mall. “There’s no typical buyer for this property. It’s going to appeal to a very wide range of groups, Ultra High Net Worth private investors, offshore groups looking to secure a freehold stake in one of the world’s top retail destinations and Australia’s most iconic and successful retail precinct. We also expect to see keen interest from major retailers looking to secure a highly sought outlet on arguably Australia’s strongest and most vibrant retail strip. “Pitt Street Mall is the most productive retail in Australia with estimated sales of approximately $1.4 billion or productivity of around $14,000/sqm and exposure to exceptionally high pedestrian traffic with 65,000 visitations a day, which has drawn high profile international retailers to Pitt Street Mall in recent years such as H&M, Zara Home, Topshop, Sephora, Forever 21, Uniqlo and Microsoft. As a result of the high retailer demand for presence along Pitt Street, it now commands some of the highest rents in the world, with recent evidence showing rates of $12,000/sqm - $15,000/sqm p.a. “There is a strong growth outlook for the Sydney CBD retail market and it’s clear that investors and retailers are positioning themselves to capitalise. “The combination of strong inbound tourism, residential development, the expanded retail offer and presence of new international brands and light rail and Sydney Metro will further enhance the CBD retail market and boost Sydney’s international status,” said Mr Rooney. However, there are limited options for contiguous space in Midtown. Vacancy has compressed to 6.4 per cent - well below the 10 year average of 8.1 per cent. Mr Sewell said, “There is tangible evidence that rents are rising in Midtown. Multiple capital sources are subscribers to the Midtown investment thesis and investor expectation of above trend effective rental growth is reflected in under-writing assumptions. This was evidenced by the recent sale of Fortius’s 75% share in MidCity Centre to Hong Kong based NGI Investments for $320 million, Brookfield’s 50% share in World Square to ISPT for $285 million and the sale of the Telstra Discovery store at 396 George Street for $26.25 million, representing a record sale rate per square metre of lettable area of $262,500,” said Mr Rooney. In Melbourne, Myer Family Investments one third share in the historic Myer Melbourne property located on Bourke Street Mall is now under contract with expectations over $150 million. LaSalle Investment Management is currently offering for sale the St. Collins Lane shopping centre and Novotel on Collins hotel for approximately $500 million.